So, you want to go to Europe. Great, you've taken your first step towards your next destination, and decided on a location. 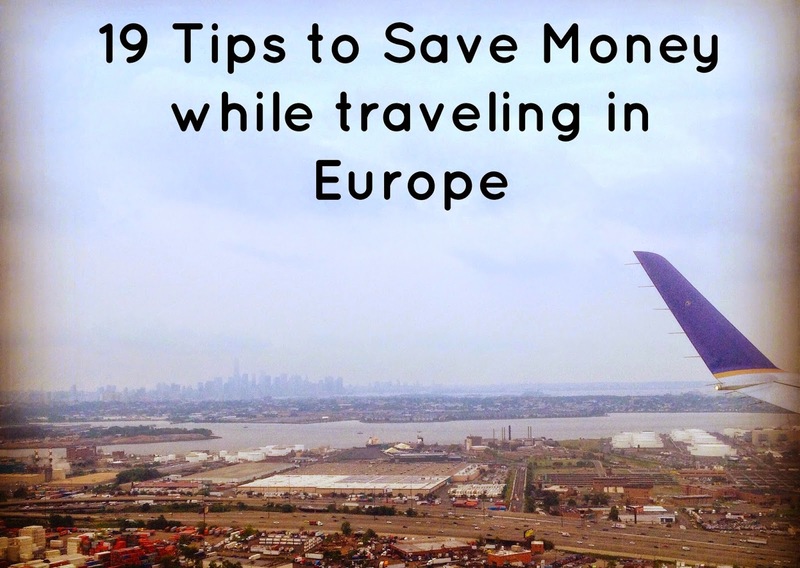 Today, I'm going to share the best European travel tips and tricks to save you $$, or €€, or £ £, whatever it is you want- I'll show you how to save it while traveling throughout Europe. 1. Flying places? My (most-recent) favorite site to search has been Skyscanner. With Skyscanner, you have unlimited options to research and pick the best destinations for the cheapest prices. All you need is a departure airport- or really, region. From there, you can be inspired infinitely. You can search for flights to specific airports or countries, or you can leave your options open and simply search for the cheapest flights to anywhere. You can search for specific dates, weeks, months, or even the entire year. The more flexible you are, the better! My open-ended search, from any Stockholm airport to any country, for the month of February. Just the beginning of course- there are tons more options you can't see pictured! 2. Use public transportation. Europe is well-known for it's amazing public transportation system, from buses to trains and more. When using public transportation, look into purchasing a 24, 48, or 72 hour pass versus a single trip pass. When doing this, look into night trains if you have longer trips- then, the train can also double as your hotel room for the evening, saving you that money. 3. Book in advance. With public transportation, definitely look into booking it ahead of time. 4. Consider alternative destinations. There are some places in Europe that are simply more expensive than others. If you are on a budget trip, you may not be able to hit all of the hot spots of London, Rome, Zurich, Oslo, etc. Instead of heading to the Swiss Alps, consider the Slovenian Alps. Instead of going to Venice for a canal tour, try out Bruges in Belgium. 5. Look into AirBnB. This past fall, my family and I stayed at an AirBnB location in Bergen, Norway. For those who don't know, Norway is one of the most expensive countries in the world to live in, and definitely to travel to. By staying in an AirBnB, we were able to not only save money versus a hotel, but we also had access to a full kitchen- saving us money on meals and drinks out as well. When traveling in more expensive locations, AirBnB can definitely be a terrific option, even compared to hostels. 6. Eat lunch, not dinner. Many restaurants will offer buffet lunches, including a drink and coffee or tea, for a set price. These deals often go until 3 PM or so- have a big lunch, and then go for a lighter dinner to save a bit of cash. 7. Find free walking tours. Many hotels, and even cities, have free or 'pay-what-it's-worth' walking tours. The best free walking tour I participated in was in Prague, and included all of the main tourist attractions. Our guide had tons of knowledge about the city, as well as distributed great tips and tricks for the stay. At the end of the tour, you can tip the guide whatever you think the tour was worth- this is often a great way to see the city, get some exercise walking, and save some cash, especially when traveling in a large group. 8. Look for free museums. Again, tons of museums will be free of charge, or offer free admittance on certain days. Most recently in Berlin, I was able to view tons of museums for free, as well as other free attractions such as the East Side Gallery. 9. Take the time to examine exchange rates. Many companies will have websites that list their prices in USD, Euro, or the local currency. When researching your destinations, take some time to examine the exchange rates and find the cheapest price. For an upcoming trip, my husband and I discovered it was almost half the price to book in SEK (Swedish Krona) versus USD or Euro. While it took us an extra three minutes to research this, the $150+ savings is a huge payoff for the three minutes of work. 10. Check out city pass cards. Most larger cities will have tourist or visitor information websites. Check these websites and look at their city pass cards. For example, in Berlin, my husband and I used the Berlin Welcome Card, which gave us free public transportation, in addition to tons of discounts at various restaurants, shops, and more. 11. Walk. Walk, walk, and then walk some more. Not only is it great exercise, but it is also the cheapest form of transportation you will find. Plus, while strolling through the city you will likely see some sights that you never anticipated. 12. Go local. For meals, check out where the locals are headed. Consider going to a farmers market and picking up some goods there. 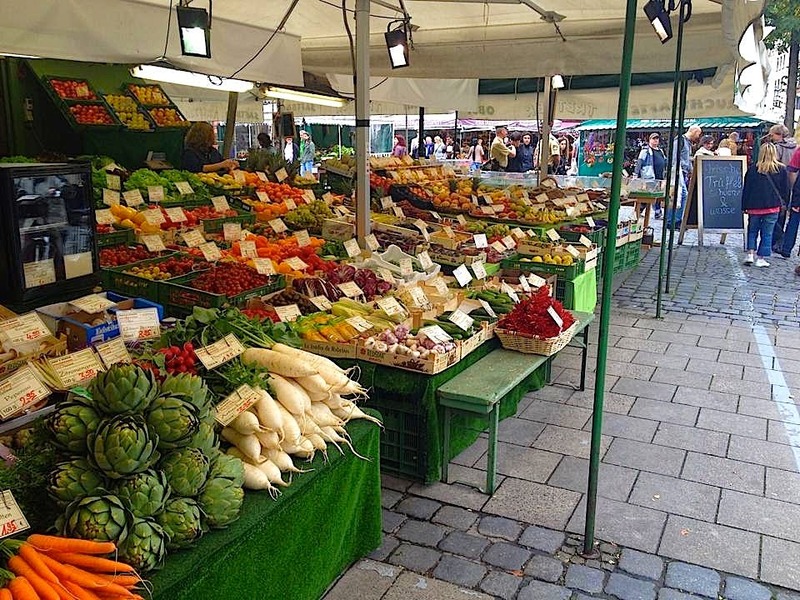 My family and I loved spending time at the Munich farmers market, and were able to find a ton of great food for great prices. 13. Watch your credit card. Using a credit card? Be careful of not only foreign transaction fees, but also the exchange rate they give you. Often, it can be a better idea to hit a bank's ATM, withdraw cash, and use that for your spending. The exchange rate will likely be better, and you won't have to worry about racking up foreign transaction fees. 14. Don't overtip, and watch for 'service charges'. In the U.S., it is pretty standard to tip 20%. This is not the case in much of Europe. Research before going what you are supposed to tip, and don't worry about going over that- even if they know you are American. Especially in Italy, watch for 'servizio'- this will often be a charge of 1-2 euro per person, just for sitting down at the table. Either refuse to pay this upfront, or if you do get charged with it- don't tip additionally. While this may seem rude, it is a cultural difference in tipping. Like the saying goes, when in Rome, do as the Romans do. 15. Utilize free wifi. International calling, texting, and data plans can- and do- cost a fortune. Rather than using one of these, just flip your phone onto airplane mode for the trip and only use wifi. Tons of cafes, restaurants, hotels, and locations will have free wifi. Use wifi and apps such as WhatsApp (or iMessaging) for any communication you may need. If you must have contact, get an unlocked phone and purchase a local SIM card and calling plan. 16. Buy souvenirs in cheap countries. Or, don't buy them at all. If you must buy them, look for what you want in cheaper countries. For example, when my family visited; I highly encouraged them to purchase souvenirs in Germany versus Sweden or Norway. You will get a much better souvenir, for a much better price. 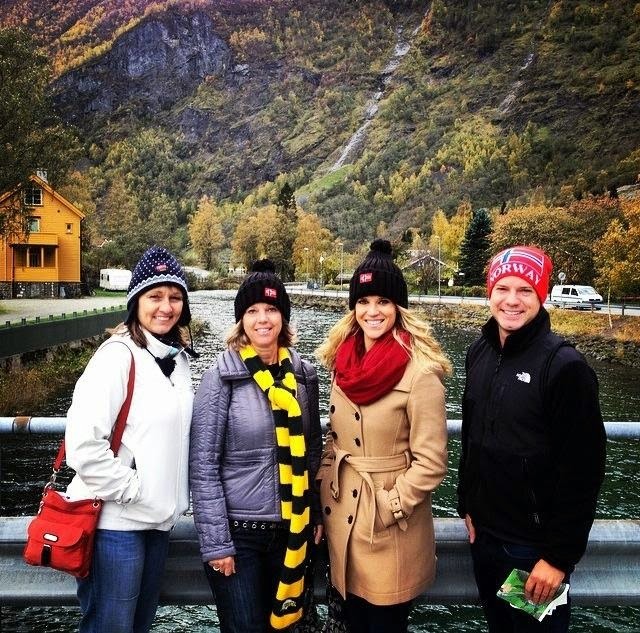 My family visited the fjords of Norway in October, which meant we saved with 'off-season' prices! 17. Travel off season. Prices, especially for hotels, will be much cheaper in the off-season. Even many attractions will be. In addition to the simple cost savings, most Europeans take advantage of their vacation time in the summer and head out- for a more authentic experience, avoid Europe in the summer months, instead hitting it in the spring, fall, and even winter. 18. Pick your focus. Just like Rome wasn't built in a day, you can't experience all of Europe in a day…or a week…or even a month. Because of this, pick a focus or area you want to experience, and stick to it. If you want to experience wine country, head to several cities in France and Italy. If you want the most 'bang for your buck', consider staying central, and visiting several bordering countries. My first ever Europe trip lasted three weeks and toured Germany, Austria, Switzerland, and Italy. By being central, we were able to visit a lot more sights for a lot cheaper than flying to many different destinations. 19. Be flexible. You know how most airlines have that 'my dates are flexible' box? Yes, it is for a reason. Flexibility can save you on flights and hotels to nearly any destination. Beyond that, being flexible may lead you to experience cheaper destinations you never though of visiting. Having an open mind is essential to making the most of your travel experiences. What are your best tips to save money while traveling, either in Europe or throughout the rest of the world? It is crazy how just be changing the currency the amount of money you can save. Great tips on here. I am with you, we walk everyone and try and hit the lunch menu instead of the much pricey dinner one. Thanks Kaelene! I was so surprised by the difference for this- paying (and registering) on the Swedish site and in SEK was about half the price from USD. So awesome! And the difference between lunches and dinners is huge. We rarely eat dinner out now! This article is like really talking to me! Yes, I want to go to Europe. We have actually watched some episodes of 1000 Places You Have to See Before You Die, and there are so many places featured which are located in Europe. OMG! Thanks for these tips! I know that I will use them someday. It will be helpful if you can provide with a long list of free museums that you recommend. Thanks for the idea- I will definitely get a list of free museums for some of the bigger cities compiled! Thanks for this informative post. I plan to be able to travel to Europe once my kids are older. I will definitely have to make sure that I keep the tips that you have shared today in mind. I hope they help make your trip enjoyable and more affordable! Miranda, where are you headed in April? If you do decide upon Norway, I found it to be reasonable after using airBNB and avoiding eating dinners out! It is very Nice and Informative Post……. Thanks For Sharing This Informative Post With Us… I Like Your Post…. This is such a great post! I've never travelled to Europe, but it's one of my dreams!! thank you so much for these awesome tips!! Lauren, I hope when you make it these tips help you! This is brilliant - I heard of Skyscanner before and I am always looking for cheaper flights. Your tip about the travel passes is so right - I saved SO much money when I was teaching in Strasbourg for the month. My card got me everywhere for next to nothing! Sara, skyscanner has been so helpful to me over here in Europe! I just wish there was something similar in the US where you could search for any cheap flights. Carrying a water bottle with you is definitely a great tip I had forgotten about! I tend to do that a fair amount when traveling- buying water while you are out and about definitely adds up, so having your own is a great money saving tip! These are incredibly good tips!! I had no idea about some of the stuff you mentioned, like using a credit card vs cash or "servizio" and I didn't know the tip rate wasn't the same across the board....except in Cuba. Alysia, happy these tips were able to help you! I have found that Skyscanner works better for Europe than some other destinations, but I love it just the same! These are super great tips for travelers.. I don't travel as much as I want to, but I've learned the best time to get plane tickets are mid-week like Tuesday or Wednesday 6 weeks before your trip, that's when they're normally the best prices compared to weekends and closer to when you plan on taking a vacation. Great tip about the souvenirs as well, that's very true. Natalie, I usually purchase tickets as well on Tuesdays or Wednesdays. Thanks for commenting! Great tips, Samantha! As a Dane, I always use Skyscanner and Momondo when I book flights. The cheapest way to get around is definitely Ryanair. I'm not sure if Interrail is as cheap as it used to be, but I know there are several cheap bus companies from Scandinavia to the rest of Europe. Miriam, I totally forgot about Momondo! I have definitely used that a fair amount. 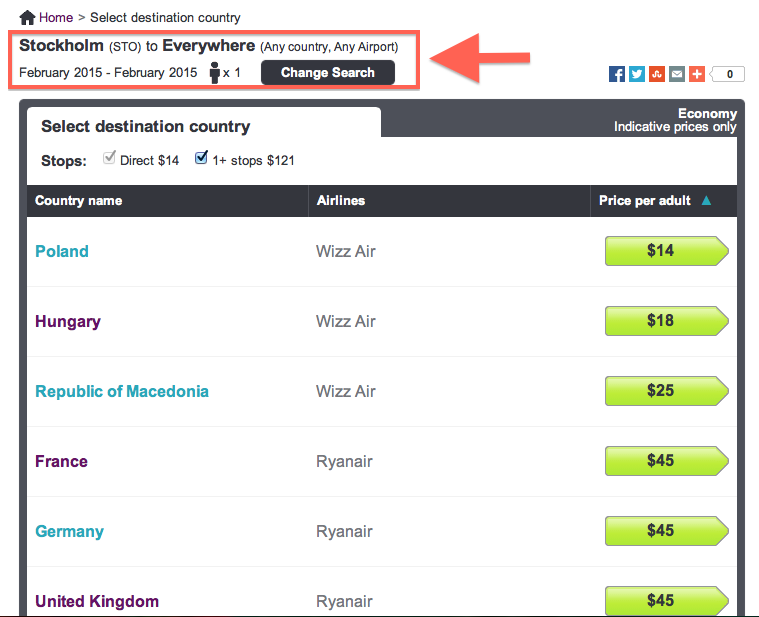 I just like how Skyscanner you can search for 'any destination' and get the cheapest ones. I haven't looked into bussing from Sweden but will have to check it out- might get to be quite a long trip though! These are some really great tips. I'm always looking for ways to save money while traveling and you taught me some great things I would never know, especially about the tip giving how it is different over there. Thanks! Happy that these tips can help you, Jessica! Thanks! Hopefully they will help ya out one of these days- and they can definitely apply to just about any travels! On the mention of your credit card. Some cards don't have foreign transaction fees anymore and actually make travel easier. Mine has no fees at all, plus if you rent a car on the card, damage insurance is provided by the card. Just make sure to let your card company know you will be oversees so they don't think its fraudulent! Great tips! Happy travels! You are definitely right that a lot of cards don't have foreign transaction fees- my Amex doesn't, while my Visa does. I know that sometimes the exchange rate they give you is not that favorable though, which is why I tend to skip using cards for smaller purchases. Like you said though, renting cars on the cards can definitely be a good idea because of the insurance! These are some great tips! We walk a lot when we travel, and we definitely eat lunch (not dinner) out when we're in countries where meals are more expensive. As expats living in EU already, we also often pack a cooler and have picnic lunches or dinners when we travel. I've (unfortunately!) never been able to pack a cooler for picnics, as usually my hubby and I are traveling in the wintertime when it is colder out. However, we do usually bring snacks/etc to sustain ourselves through the days! That is so true Sara. My family and I used it while in Norway, and it was great for four people- like you said, cheaper than all of the hotel rooms, and great to have common areas to gather! This is so so helpful! Especially since I'm moving to Europe in April! That is so exciting Sara! Where are you moving to? These are great tips for our future (very far in the future) trips to and around Europe. I especially like the one about eating out for lunch rather than dinner! I would have never thought of that before but duh! Totally makes sense! Thanks Alyson! With lunch instead of dinner, often it is the same exact food and portions- just a cheaper price! Hi Anna, thanks for stopping by! Not tipping as much can be difficult for me, but it was just part of different cultures. I have worked as a server in the U.S. before and it always drives me crazy when Europeans don't properly tip- so I just remember those experiences, and that it is important to adapt. Wish everyone would do it when visiting new places. Thanks Yvonne! It's definitely not necessary to do every single tip, but sometimes even just a couple of them can help you save so much money! Thanks for the tips! This is really timely since Phillip and I are toying with the idea of Europe. It may not actually happen for a long time, but still timely advice for us. Jenny, I hope you are able to make it over to Europe soon! These are great tips to save money when you are here. And it is a good time right now to travel to Europe since the USD is doing so well! I loved this post. I have never checked out Europe but you really make me wanna do it soon. Thanks alot for sharing. Great tips/ideas!